The following is a list of programs suited for small groups to reflect on the values of Voluntary Simplicity. To understand the meaning of voluntary simplicity. To consider how life might be enriched through the practice of simplicity. To explore the material and psychological distractions that prevent us from caring for the earth. The Meaning of Simplicity: The concept of simplicity, as a religious practice or philosophy of life, has a long history. Inner simplicity and outer simplicity are both involved. What are some common misconceptions about a simple life? Readings: excerpt from Voluntary Simplicity by Duane Elgin, “Living Deeply” by Janet Luhrs, excerpt from Gift from the Sea byAnne Morrow Lindbergh. Living More with Less: Accumulating material possessions is part of the American Dream. For some, the dream has become a nightmare. When do material possessions add meaning to our lives and when do they detract? Readings: "The Lesson of the Hummingbird" by Eknath Easwaran, "A Spirituality of Contentment" by Dee Dee Risher, excerpt from Living More with Less by Doris Janzen Longacre. Your Money or Your Life: A growing number of people wish to resolve the conflict between the desire to make and spend money and the desire for a simple life. Why is that so difficult in our culture? Readings: "Economy and Pleasure" by Wendell Berry, excerpt from Your Money or Your Life by Joe Dominguez and Vicki Robin, "Remaking a Living" by Brad Edmondson, excerpt from Downshifting by Amy Saltzman. Do You Have the Time? In modern society, our minds are focused on the “busyness” of the day, our current problems, and our future challenges. Are there alternatives to the fast pace of our mainstream culture? Readings: "Do You Have the Time?" by Ralph Keyes, "Simplicity, Time, and Money" by Mark Burch, excerpt from Plain and Simple by Sue Bender, "Washing the Dishes" by Thich Nhat Hanh. How Much Is Enough: As a society, we engage in patterns of material consumption that are damaging the environment. How much do we really need? Readings: "Wealth, Well-Being, and the New American Dream" by David Myers, "How Much is 'Enough'?" by Alan Durning, "Waste" by Wendell Berry, "The Conversion of the American Dream" by Tom Atlee. Swimming Against the Tide: Our country's guiding economic principles push growth, consumption, and technological advance as inextricable and desirable goals. In our efforts to live simply, we may feel like we are swimming against the tide. Readings: "Growing up with Technology" by Jerry Mander, "Can't Live without It" by Alan Durning, "A Declaration of Sustainability" by Paul Hawken. The Practice of Simplicity: There are countless practical benefits in moving toward simplicity. What steps can be taken to move toward a life simple in means, rich in ends? Readings: "Conservation is Good Work" by Wendell Berry, "Know That What You Eat You Are" by Wendell Berry, 'Waste Reduction" by Recycling Advocates. Our discussion courses on sustainability, deep ecology, living in place, and the practice of simplicity were originally offered in Portland-area workplaces. The courses soon spread to centers of faith, homes, and neighborhoods, then to other Northwest communities, and ultimately across the country. Today, through the National Earth Institute Network, interested individuals anywhere in the United States can be involved. You can become a "local organizer" and start the earth institute process where you live. 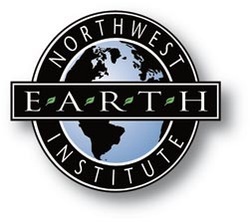 The Northwest Earth Institute supports the commitment of individuals who respect and seek to protect the earth. This anthology is formatted for use with small groups or self-study, with options for four, six, or eight sessions. This packet is a five-week process focused on affluenza, overconsumption, sweatshops, the environment, and simple living. Suitable for use by small groups as well as individuals, each session contains prayers, reflection questions and action suggestions. 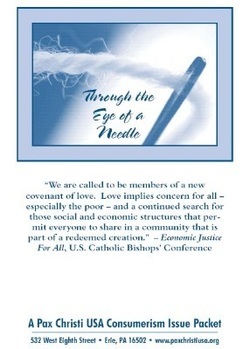 Great for introducing social justice issues to your parish or small group. Produced by Pax Christi USA. Purchase here. The New Road Map Foundation created a Christian group study guide, produced and distributed by the (now defunct) Simple Living Network. 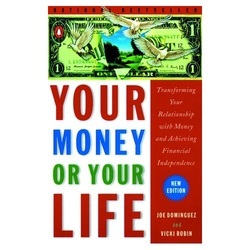 It is for use with the bestseller Your Money or Your Life, by Joe Dominguez and Vicki Robin. Session 3: What is Money? This is a movement of small group gatherings focused on voluntary simplicity (not necessarily with a faith-based focus). 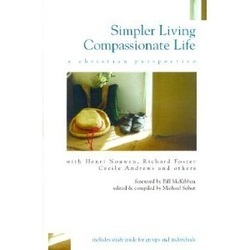 A companion to Living More With Less, this practical guide is divided into 17 session. The compact sessions have sections that are essentially 4-5 pages of lists with ideas for each of these areas: Goals, Study, Action, Scripture and Sermon Ideas, Resources, Music, and Organizations. Note that many of the options in the Videos section are formatted in short segments and provide a study guide, making them well-suited for small groups.